Wisdom Chikuni hails from Masambuka village in Malawi’s Zomba district. After learning he was HIV+ as a teenager, Wisdom wanted to end his life. Fortunately, after joining Dignitas’s Teen Club in 2010, things started to turn around. At Teen Club Wisdom formed friendships with other HIV+ teens and received the counselling he needed to plan his future. 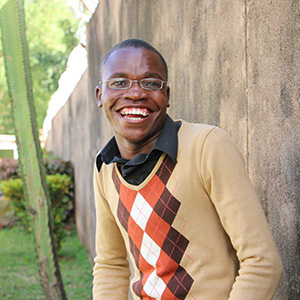 “Before Teen Club, it was very difficult for me to accept that I was HIV+,” says Wisdom. “I wasn’t taking my medications regularly and was sick frequently.” This negatively impacted Wisdom’s education, as he spent many days at home. At one point he dropped out of school altogether. Wisdom’s health improved significantly upon receiving guidance from other Teen Club members and health care providers. He gained a new outlook about his status and future. Once he got the support he needed, Wisdom returned to school and excelled at his national exams. Now he hopes to attend university and become a computer engineer. Today, Wisdom is an executive member of Malawi’s National Association for Young People Living with HIV. He is a role model for HIV+ youth.